GameSim+ is a subscription service that gives you access to extra features. Ability to run multiple simulations at once. Play Fantasy Baseball, Football, or Basketball? Use GameSim+ to view projected player stats for MLB, NFL, NBA, College Basketball, and College Football games. NFL/NBA: View fantasy points using official league rules or Draft Kings scoring formats. NFL/NBA: Use "What If" scenarios (allows making players inactive for simulations) for Daily Fantasy player projection scenarios. Ability to view "behind the scenes" into the factors that help determine the simulation results. Ability to adjust rosters by sitting certain players out for a simulation. NCAABB/NBA: Ability to see predicted first half score. NCAABB: Ability to run the NCAA Tournament simulation with one click. This feature will become available shortly after the brackets are released. NBA: Ability to run the NBA Playoffs simulation with one click. This feature will become available shortly after the brackets are released. 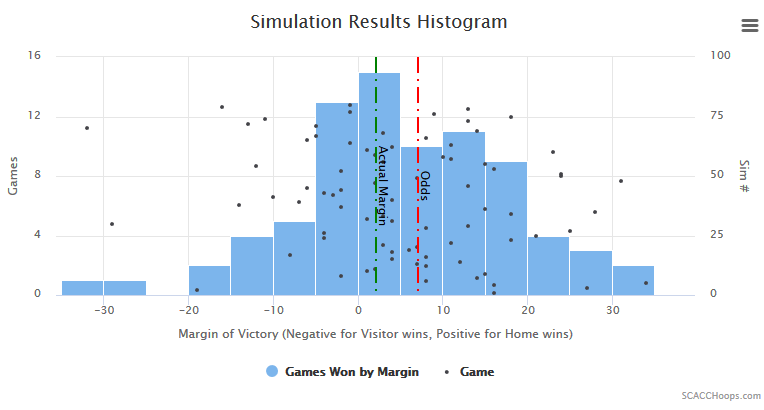 MLB: Ability to adjust lineups and starting pitchers for a simulation. Milestones are catalogued for rare statistical highlights viewed during simulations. New features will be made available first to GameSim+ users. GameSim+ Premium: Add $5 to your select subscription. "College GameSim+ has helped me tremendously. Their simulations are truly the best! Thanks to them, I am a 3 time bracket champion." "Huge fan of Game Sim! I purchased GameSim+ for the NFL season and love it. Thanks, and keep up the good work!" I want to take two minutes of my time to tell you that you are doing great work on your site. I love it and it makes me happy to pay again and again for excellent services. Why isn't this FREE like the rest of the website? You might be wondering why NCAAGameSim.com can't remain FREE. It's a valid question and one that I would like to address. For the first 12 months this website had remained FREE, and those features will remain so. Over the first year, I was able to gauge the potential advertisement revenue as well as determine demand. Fortunately the traffic on the site was quite high, but the ad revenue isn't high enough to keep moving the website forward. This brings us to GameSim+ which offers some new features. It also gives YOU a way to support the site and gives us a nudge to keep adding new things.